Here is the other half I promised! I love this post, because everything in it was SO EASY to do!! I wish that I had more outgrown clothes of hers to play around with! 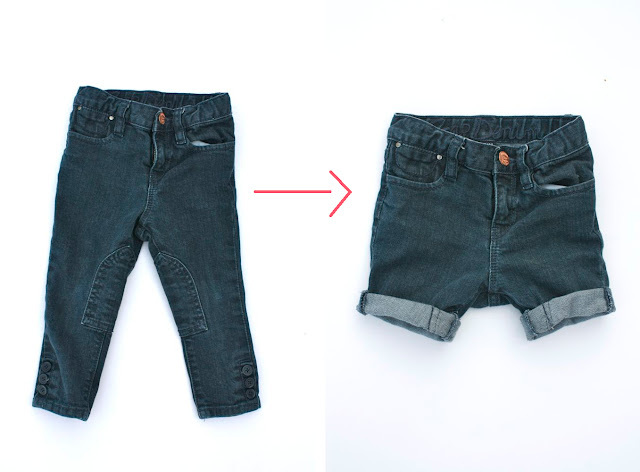 And here's an obvious one: Cut-offs! Confession: I didn't actually do these. I bought them from the owner of a children's consignment store who distressed them herself. That counts, right? :o) I love them! Gilligan never looked so cute! I don't have a "before" of this one, but it was a pair of lounge pants that were stained and worn at the knees. I just cut them off right above the inseam, and viola! A little miniskirt to wear over leggings! No sewing involved! 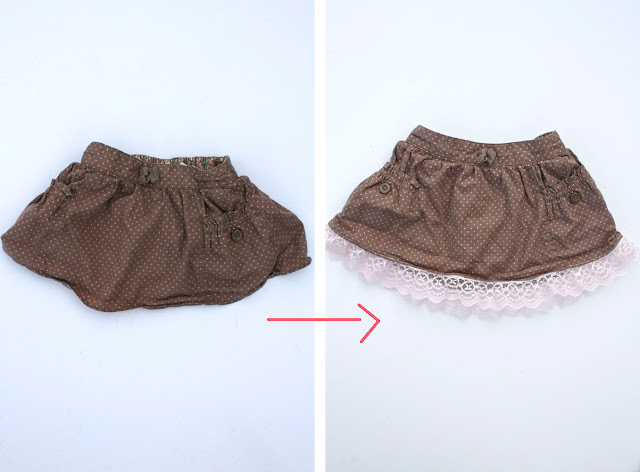 These little knit shorts were perfect to add fabric to, to make a skort! I love skorts, because, well, sometimes my little lady....isn't one. 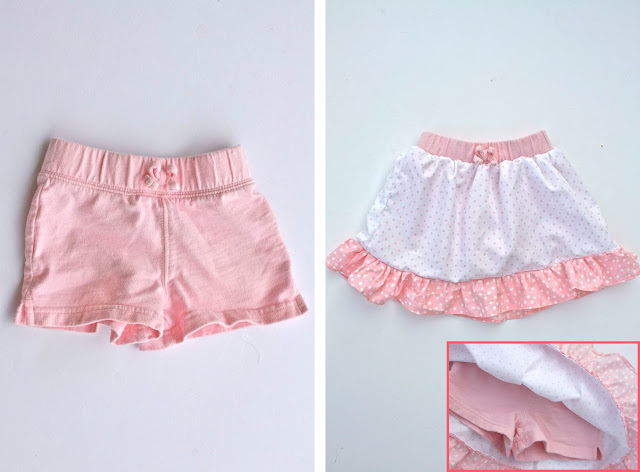 :o) Plus-huray!-no need to make the waistband, which is the part I don't like to do. Sometimes all you need is a little lace to give you just a tad more length! I like how it made the skirt more feminine, too! This one made my heart so happy! And I discovered it quite by accident. I have TONS of short-sleeved jammies for Paige, but she gets too cold in them at night, so now I know what to use all of her too-short pj pants for! Sleeves! And this one, from a little shirred-waist sundress! I seriously almost died when I had to cut into these jeans. Jodhpur skinny jeans?? So cute!! But the legs were always a little too small for Paige. 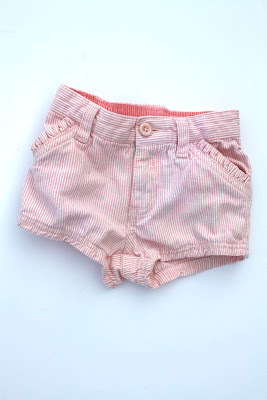 So, now they are adorable little rolled-cuff shorts, ala JCrew! I have to say, I think the shorts are even. cuter. This little Target coat is one of my favorite things I've ever gotten Paige. When she got too tall for it, I was in total denial! So I turned it into a cropped jacket! Fun! And remember, just because some things are out of season, doesn't mean you can't wear them with a little imagination! 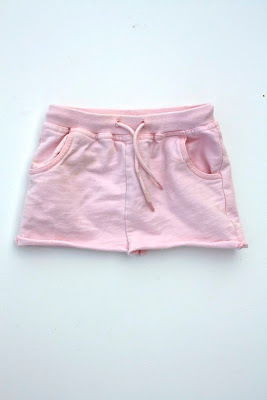 I love these little pink ruffly shorts! 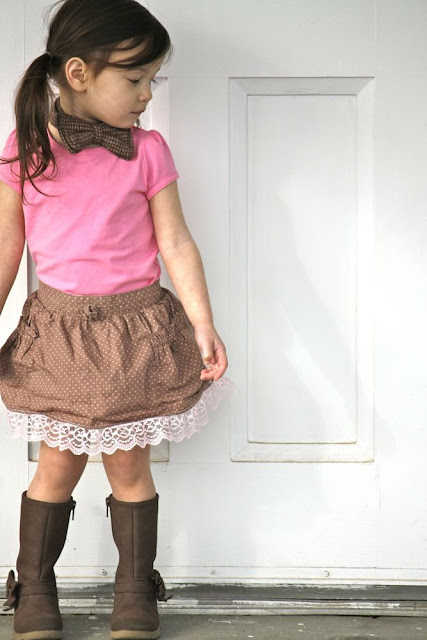 And toddlers can get aways with any trend! I hope it gave you a few ideas! Ahhh! All I can say is you are awesome! I can't wait to try and show you! Very cute, and some good ideas. Thanks! These are SO wonderful. I am starting to get very sad that my bebe' is getting so big and the clothes just don't get worn more than a couple of times. This is such a great way to use them again! Your ideas are so fabulous and I'm completely inspired by you! Thanks for sharing! 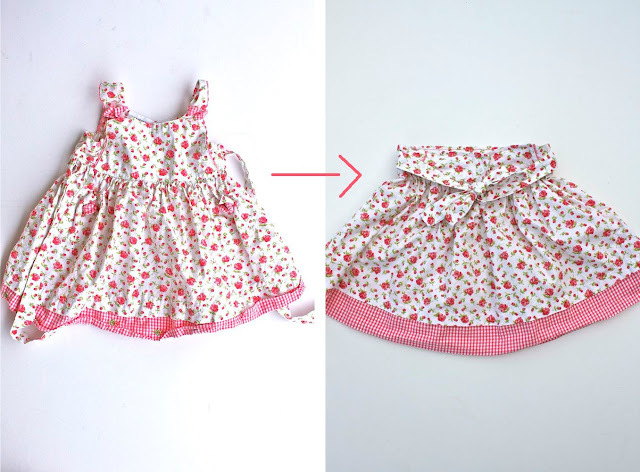 I love your ideas, I am always trying to redesign the kids clothes to last a bit longer, thank you! WAY COOL...wish my daughter was 2 instead of 22!!! LOVE ALL OF THEM! Wow! I really adore these creative ideas! I love that you are also teaching your daughter to enjoy what she already has...a lesson us grown-ups should learn too. cant get over on how creative you are! she looks So beautiful! I can't believe you are making things from size 12m for Paige! That's awesome. Very cute as always. I need to go thru Madison's closet & do some revamping myself. Nice job! thanks for the inspiration. 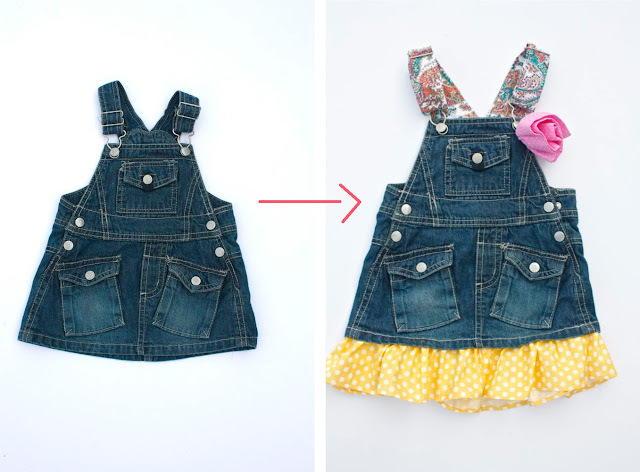 I have 2 girls so I can't wait to go through #2's closet and revamp some of her clothes. I already patched up some of her jeans with super cute patches. But I'm sure I could extend more of her wardrobe. This is amazing! I love each of these ideas. How do you dream these up? So adorable. I only started following recently and I love everything! I had so much fun scrolling back through your posts. Thanks for taking the time to share your creativity. Your daughter is too cute. I especially like the cut offs with the pink top and pink converses! omg! you are giving me idea's for my sons clothes and mine! Hope you'll come by my blog...I'm having a "Alice in Wonderland" charm swap! I think you'd have fun with it! You are very creative! Thanks for sharing your ideas. P.S. I made some of those knee high socks with the bows on the back. Adorable! Your daughter has to be one of the cutest kids ever! Wonderful redesigns! I love Paige's accessories...they really make the outfits! Awesome stuff, as usual! Your daughter looks ADORABLE in ALL those outfits. I hope to have a fraction of your creativity by the time I have babes who are growing out of clothes! I feel like I have to tab every post you do!! Great ideas! What I'd love to know is where do you shop?! All her little accessories are gorgeous (the brown boots, the grey hat). Terrific stuff. You have great taste! Oh my goodness! You are BRILLIANT! When does your mind rest? Love the PJ bottoms into shirt sleeves. Perfect use for all my jammies that have super stained tops but the pants are still good. I have serious wardrobe envy....of a toddler! I will aim to dress more like Paige ;) what a lucky girl. So cute, as always! You're so crafty! Could we get a tutorial on the overall straps? PLEASE, PLEASE, PLEASE!!! I love all of your ideas. When she completly out grows them you could make a quilt out of some of your favorites, I saw that on another website, So CUTE!!! You have the most amazing ideas. I love all of these. And your daughter...I still can't get over how adorable she is. Fabulous ideas, great work! I too go into denial when my daughter grows out of something I love - now I know how to fix that problem! Once again, pure brilliance! Love them all. Wow, what great ideas! You are amazing! I love the skort idea especially! Great job! OMG!!! I don't have kids, and I don't sew, but I LOVE seeing what you come up with (and now I want to learn how to sew - long story but I NEVER thought I would want to)! P.S. Your daughter is the cutest model! so cute! i wish i had a little girl, i need ideas like this for my boys! :) although some are adaptable. wow, you are amazing! great ideas! I have done a couple of these, and there are a couple others I NEVER would have thought of. Thank you for doing these posts! I love all of your creative ideas and plan to do some of these things. So cute as always!!!!! I love the straps on the overalls. I already pulled out a pair to start on. Thank you for your inspiration!!! 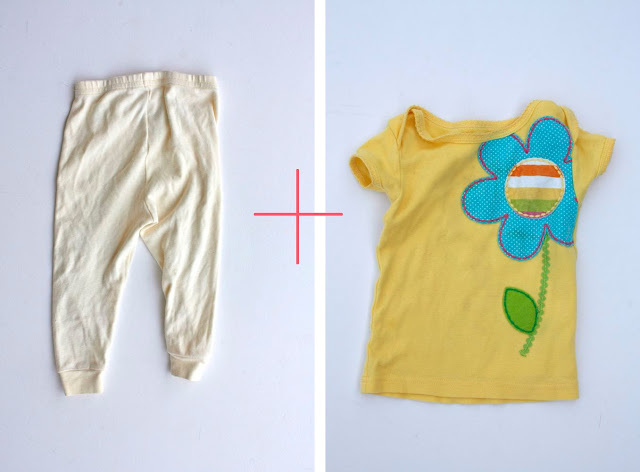 I just started altering my daughters summer clothes and you have given me even more ideas. Wow, those are such great ideas! Love them all! 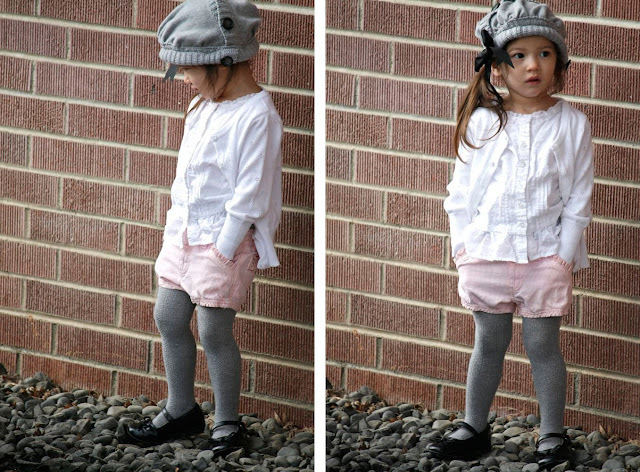 I especially love the too short pants into a long sleeved shirt...brilliant! These are so cool and your ideas are motivational too. I can't wait to try to get some more use out of the pile of clothes I have laying around. I love it! Thanks a ton! More awesome ideas. You are so amazing. And your daughter is so adorable. She could make you rich if she modeled in kids' magazines. I'm going to try out every single one of these! I especially love that you have Paige model each item so I can see just how cute they turn out - all so wearable! Of course, I'm guessing she'd make a potato sack look haute couture. I also love that you accessorize her to the TEE! My 3 year old also loves accessories and can't leave the house without her purse and sunglasses. 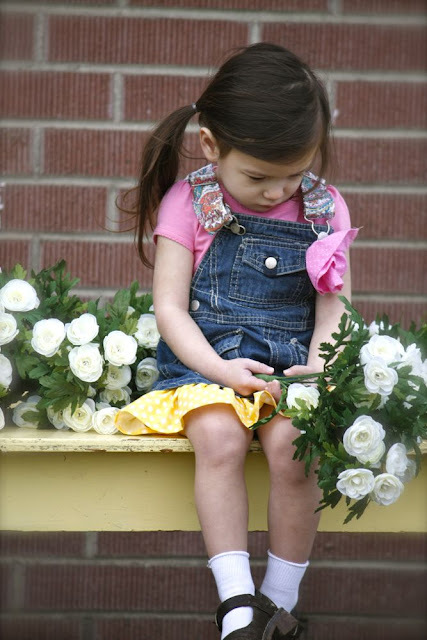 I love it that you show your cute daughter wearing the new creations because they always turn out so cute and are always so much cuter on, and they way you pair everything it is adorable. You should give classes on this or post them to You Tube. What you do is amazing!!! As always, these are such awesome ideas!! I've added ruffles to pants before and have converted sundresses to tunics (just add jeans underneath, how easy is that??) but would never have thought about using pants to make long sleeves. Thanks for another great post, I am so inspired by you! What a lucky girl to have you for a mama! I LOVE these ideas! I hope you don't mind my asking, do you plan on having more children? How do you decide what to save for later babies and what to "remodel"? Great ideas! I have five girls and so far I always just left the clothes for the next ones. But now as it seems this one is the last one, I just might think about altering some of the clothes she is growing out of. Such fun ideas and cute pix.... so much inspiration here!! What great pictures and clever ideas! Amazing! You are SO talented. 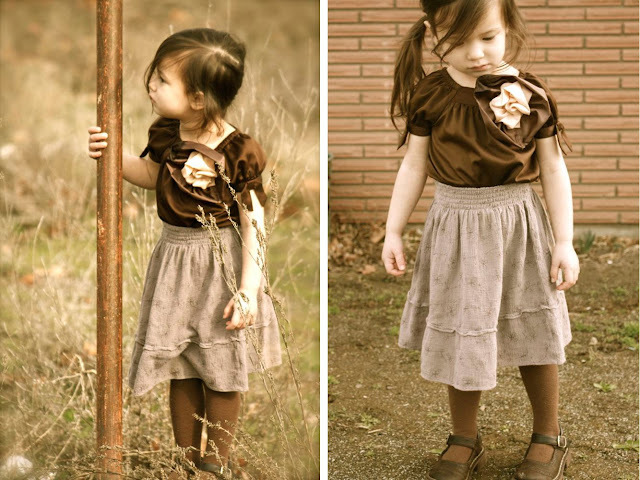 That last picture is super cute--LOVE the outfit. they're all awesome ideas!! I love the PJ legs turned into Tshirt sleeves! 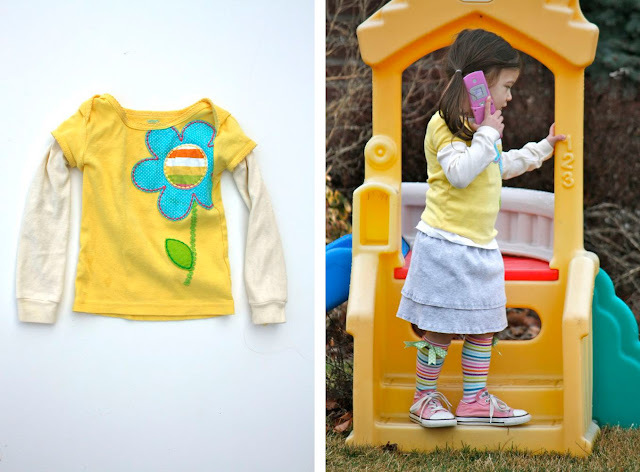 I love all of your wonderful, creative posts, but I'd have to say these two on re-making toddler clothes have been my favorites. You really are amazing! Thank you for sharing your time (and Paige's) so generously. You are amazing! I want to do all of these--now I just need the child! I am so so so glad you do these! You are amazing. And I'm really glad you have a daughter! I have a daughter too and this helps me a ton. She's almost 7 months and has a BIGILLION 0-6 month clothes and only 12 items ranging from the 6 to 18 month range, including a really ugly one piece something or other (couldn't return it). I've been tempted to do something like this with her clothes before I go out shopping. Hopefully they are sewing tasks I could handle. You make them look easy. I LOVE these posts! I have three girls and a limited income. So I can really put this to use. Plus it's so fun! Thankyou. Thanks again for your inspiration...i am now re-purposing everything! Yesterday a ruffle to jeans and sweater and today a dress into a skirt. Wow! I don't even have kids and this is an amazing entry that will be saved on my laptop for years! 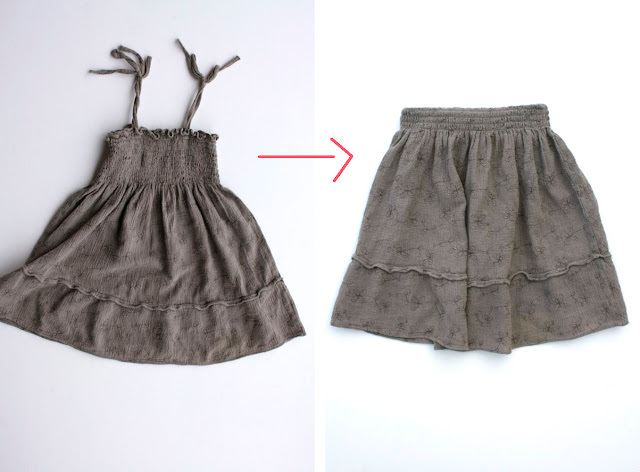 I have stopped donating my daughters clothes. All of your ideas have given me inspiration to re-fashion them! Yay! Keep doing what you do-you are awesome! You are one gifted woman. It is such an encouragement to see what you create with what you have. Awesome! They are all absolutely adorable. oh thank u so much, have been looking forward to this post ever since saw the "tops" one. i especially love the overall one as my 1yr old has quite a few of them that i really loved. now just to add a ruffle and new straps...yippee. Thank you for your great idea. Your daughter is so cute and beautiful. Those are such cute ideas! Way to go! More fabulous ideas! I love it!!! Thanks. I have to say once again, your creativity inspires me, and so many! 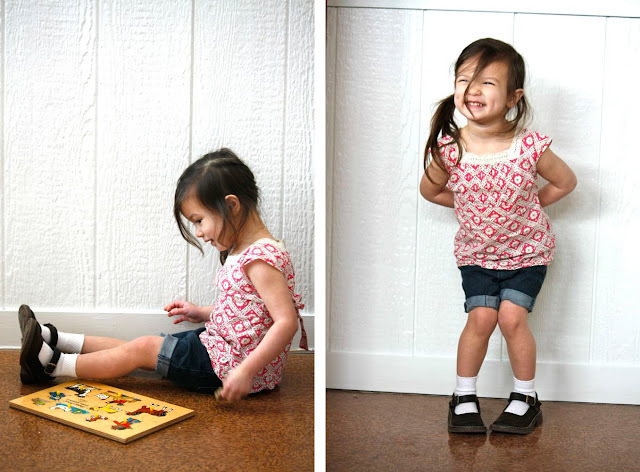 I love your stuff, you are so creative, and obviously your muse, Paige, is the most stylish kid around! Love love love!! I think your pyjama's to long sleeve top is soooo smart! I'm linking to this from Project K's facebook today! I know a lot of my readers are following you now to!! they just love your work! I don't think I'll ever tire of saying this: YOU ARE GIFTED! Seriously you are. Great ideas as always. Love your blog, love your tutorials... you are a genious!!!! Disney these just as fabulous as the previous ones! PS. I love your sweet, sweet blog! Man, I love you! You should have your own show or something. I'm also looking for a bow tie now! LOL Love that idea. LOL I thought I had style, you have it going on! I stumbled on your blog last night! You are amazing!! I LOVE your ideas! Thank you for sharing your creativity! I would love to link to my blog! i love this post, so inspiring...i'm going to have to keep these things in mind when going through my daughters clothes...she grows out of everything SO fast. These are SO amazing. 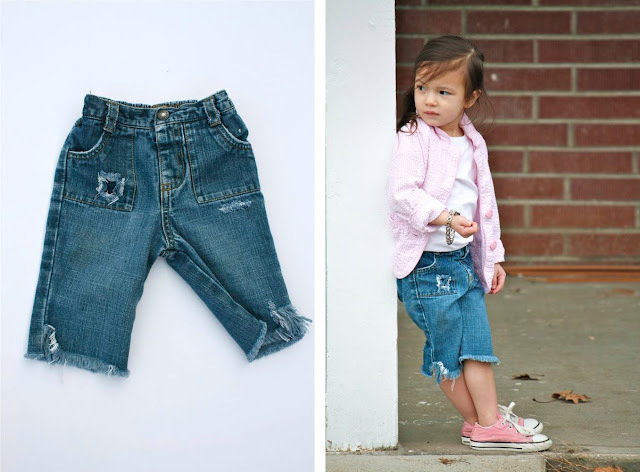 Could definitely use some of this inspiration for all the clothing my kids are growing out of! I've featured it in a DIY roundup on my site today. Thanks for the great ideas!! Adorable post as usual! Such a creative mind! Too cute! I love seeing things re-done and re-purposed! This is adorable! She looks like such a fashionista; even dresses better than me! note to self: learn to sew. (I've been telling myself that for years, but I never listen). DUDE! I am crazy excited to find this post! I have TWO bags of 3T's (she is now a 4T-5) that I have been meaning to take to local consignment shop. Not any more! I'm going to bust those babies out and get to work :) you rock! 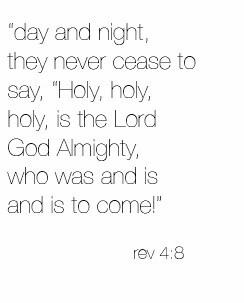 SO bookmarked. I've been thinking about this a lot as I've altered some of my own clothes for work/weather. I just feel like sometimes getting her wee things into the right position in the machine is SO much harder. YOu have the cutest lil lady! I absolutely love all of these ideas! with the button up dress you turned into a skirt, do you think the same can be done with a zip up dress? if so, any ideas how? Ahhhh, I am in love!!! Now I know hot to make the stained or short closes even cuter. hermosas!! las cosas que haces, tengo tres nenas y imaginate ahora a reciclar toda la ropa que guardo y a seguir usandola,gracias. LOVE what you did with the overall dress! So cute!